Welcome to San Mateo National Little League and the 2019 season! If you have any issues with the website please click on the "Contact Us" tab on the left hand side and we will get back to you shortly. SPRING 2019 REGISTRATION OPENS ON OCTOBER 15th. Please click HERE for 54/80 division registration info! Registration for Wiffle, T-ball and A-ball divisions will stay open until mid-February. Registration for AA, AAA and Majors will close on 1/13/19 (day of tryouts). Are you eligible to play in San Mateo National Little League? YOUR PHYSICAL ADDRESS OR YOUR CHILD'S SCHOOL LOCATION MUST BE IN OUR BOUNDARIES. No Residency/School requirement for Wiffle Ball. All returning families to SMNLL can simply log-in to their account that was created last season. New families must create a new login and password and using the REGISTRATION link. You will only need one login in order to register the whole family. New registration should be intuitive and easy to use! Simply register your first child and follow the prompts. Questions with a * are required fields that you will need to fill in. At the end of the first registration you will have the opportunity to add another child. *Note: Registration is not complete until you CHECKOUT of registration. All documents must be uploaded and verified. See your "Profile Page" for any outstanding fees or documents that the league still needs from you. Our league is run solely through the time and efforts of our volunteers. Without moms and dads and other family members participating on a variety of levels, the league wouldn't be able to function and our kids wouldn't have the opportunity to play this great sport. Volunteering is easy, simply click on the registration link and follow the prompts. Volunteer opportunities include coaching, team parent, field prep assistance, opening ceremonies assistance, and more! The system will prompt you for the required documents (ie. birth certificate, proof of residence). Simply scan and upload the documents to your profile and you're done! 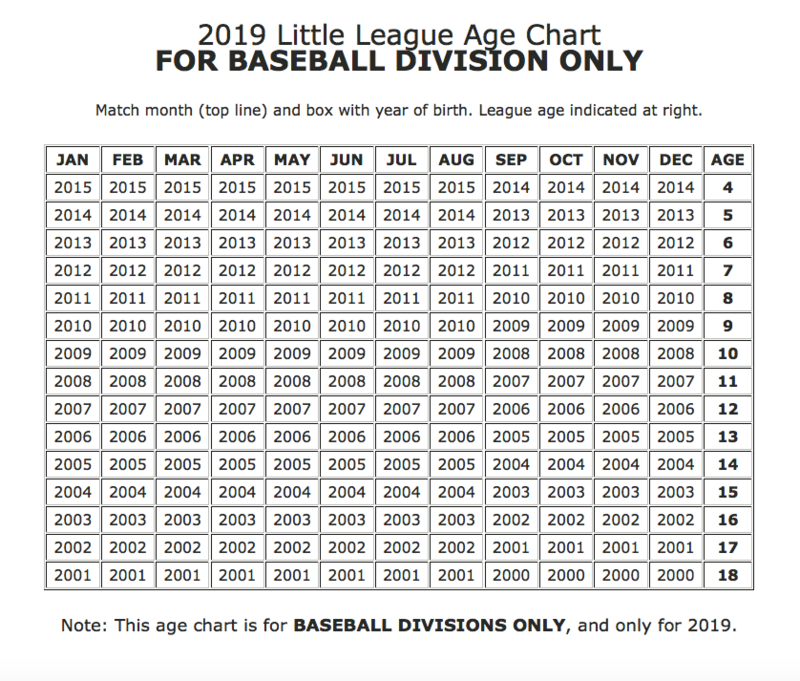 Age Determination chart for 2019 season. To learn your child's game age, click HERE. These are the recommended divisions by age in our league. All 7's and 8's that aren't drafted in AA are placed in A division, 6 year olds that played T-ball last season will be placed in the A-ball division. A-ball division is coach pitch. Players must attend tryouts to be considered for this division. All 9 year olds are drafted into AA or AAA. 7 and 8 year olds that are not drafted into AA will automatically be placed on a team in the A-Ball division. AA coach pitch for the first half of the season, then a hybrid of kid/coach pitch for the second half of the season. Players must attend tryouts to be considered for this division. All 10 and 11 year olds will be drafted in AAA. 9 year olds that are not drafted by a AAA team will be drafted by a AA team. AAA is kid pitch only. Players must attend tryouts to be considered for this division. All 12's will be drafted in Majors. 10 and 11 year olds that are not drafted by a majors team will be drafted by a AAA team. *Please note that children aged 7 and above, must attend tryouts in order to be eligible for draft consideration for divisions AA through Majors.